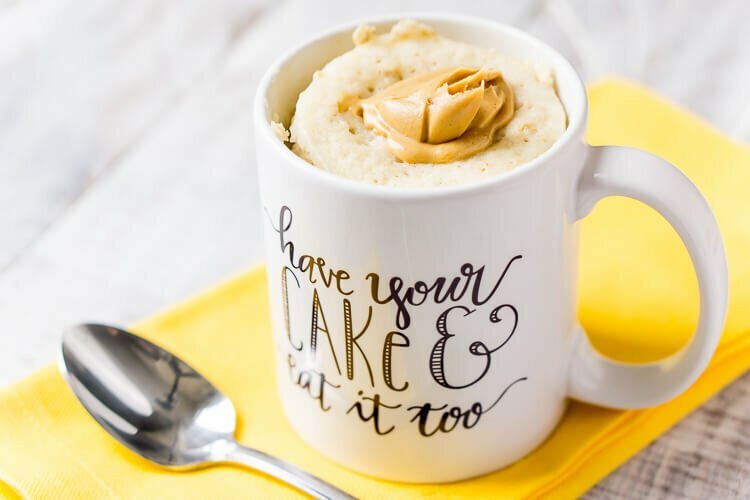 This Peanut Butter & Oatmeal Mug Cake is a simple and fast, sweet and salty fix for dessert or breakfast, it’s ready in just 5 minutes! 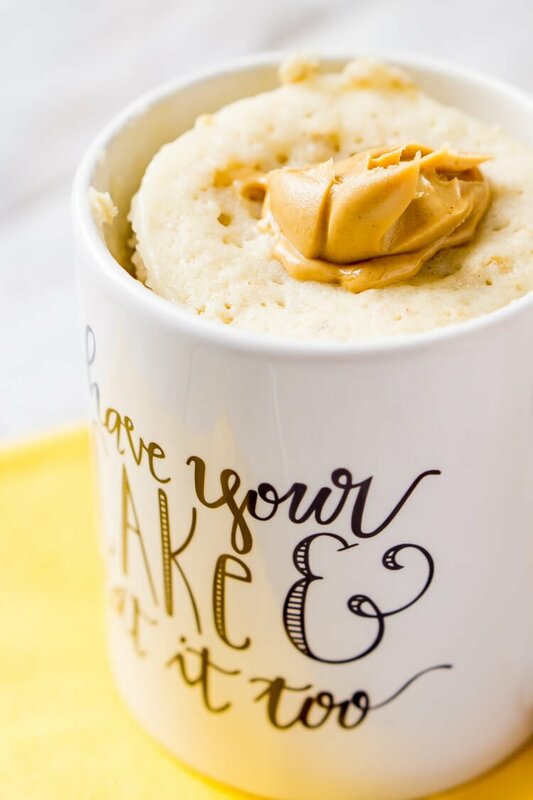 This Peanut Butter Oatmeal Mug Cake is the perfect way to enjoy dessert for breakfast! Okay, okay, I shouldn’t be encouraging cake for breakfast, but it’s got oatmeal in it and it’s served in a mug. Plus it tastes like peanut butter toast, so hey! Why not! You see, I make a pretty good argument (it must be the law firm rubbing off on me) and you’re already telling yourself it’s okay to enjoy this little cake with your sweetie and a cup of coffee over the morning paper. And it definitely is, this is your life… it’s time to start living it right! And by right, I totally mean cake for breakfast! A lot of people might say mug cakes are out, but guess what, they’re great for people like me with no self-control when it comes to sweet stuff. Mug cakes are the perfect fix when you just need a little something! This is a double batch mug cake, making it perfect to enjoy with that special someone, Valentine’s Day is approaching after all! A light and fluffy old fashioned oatmeal cake with a rich peanut butter center, it tastes just like peanut butter toast! But feel free to cut the recipe in half to enjoy a smaller portion! See how easy this mug cake is to make in this video! 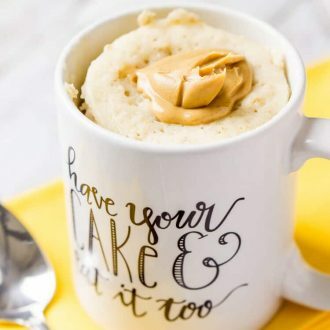 This Peanut Butter & Oatmeal Mug Cake is a simple and fast, sweet and salty fix for dessert or breakfast, it's ready in just 5 minutes! Whisk milk, vegetable oil, and sugar together in a 12 oz. or large mug. Whisk in the oatmeal, baking powder, and salt until full incorporated. Spoon 2 tablespoons of peanut butter on top and push slightly into the batter. Microwave on HIGH for 30 seconds, and then in 15-second bursts until the top looks dry and cooked and springs back when pressed with a finger. Mine took about 90 seconds to cook. Top with the remaining tablespoon of peanut butter and let stand at least 5 minutes before eating. Throw a small handful of mini chocolate chips into the batter for extra fun! 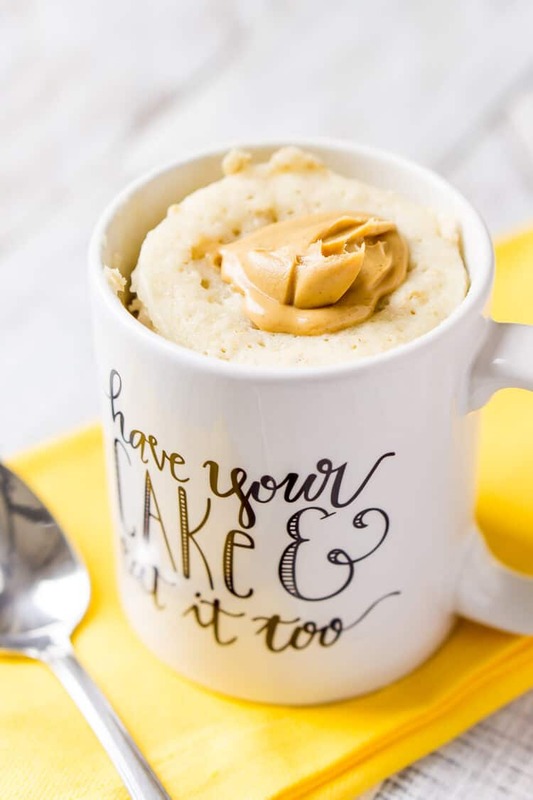 Pin this Mug Cake Recipe for Later! This post was originally published in January 2015 and was updated January 23, 2017. Oh my goodness! I want to try your recipe soo bad! I’ve never had a mug cake but it looks and sounds perfect for breakfast right now! I’m off to try it! Thanks, Carisa! It tastes just like peanut butter toast! This is such a great idea and looks so delicious. Thanks so much for sharing. If I don’t want to use sugar, what can I use instead? Honey? You can try leaving it out all together, I wouldn’t use honey as it’s a completely different base and could mess with the texture of the cake. You can try doing coconut sugar instead, I will tell you that coconut flour will not work with the ratios given. Oohh, those sounds like yummy substitutes! I always hate waiting for something to cool, when it comes to dessert, I always want it right that minute! I’m so glad you enjoyed it! This was delicious. I needed cake and this totally satisfied. I didn’t have plain rolled oats so I used instant maple brown sugar oatmeal. Yummy. I’m so glad you enjoyed it! It definitely hits the spot when you have a craving! Can I add an egg? The recipe doesn’t call for an egg.